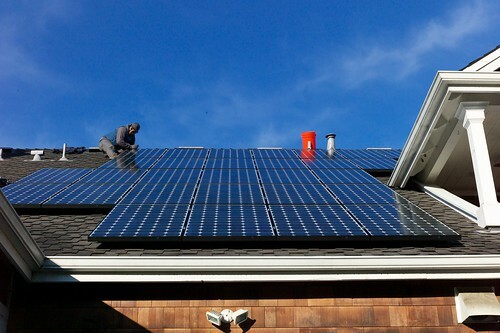 Have you been thinking about taking advantage of tax credits to install solar panels this year? If so, check out the thread Going solar to join the discussion of how to size for growth, bulk buys with other people, tax credits, and buy vs. lease programs. We have good local tax incentives plus the ability to save on installation via a bulk co-op purchase such that the economics look WAY better than I expected (breakeven estimated in 5-6 years). Anyone want to share your experiences with solar – pros, cons, pitfalls, surprises, benefits? When considering the number of panels to install, we thought a lot about growth. We’re incredibly frugal with electricity now, but don’t have to be so stingy with lights and such once we’re using solar. Also, our kids will use more as they got older and we’ll probably replace our aging cars with plug-in hybrids eventually, so we’re getting more panels than we required to meet our current needs. I think we added three panels above the installers recommendation for meeting current usage. I know a few people with panels who generate more than they use — and then sell the excess to the power companies. So they get a monthly check. Now *that* sounds awesome. …we just got some of our initial paperwork and it indicates that if you replace your roof as part of the solar installation process (not sure how intertwined these need to be – if you have to use the same contractor or what), the roof replacement costs are also eligible for the 30% federal tax credit. Do you have advice or questions about going solar? Add it in the comments below, or join the conversation on the forum: Going solar.